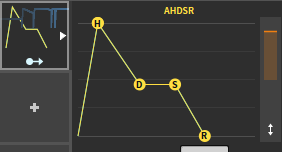 I just recently updated to 2.2 and since then i have a weird case where an AHDSR (the ADSR too, in fact) does some jumpy movements before the actual note hits. It's like it's registering the notes too early. See it should only play 2 notes, but it always pops up once before the actual note plays. How to cut an audio stream in 1/32 notes ?